The WPSS U13 group have departed for Japan for a once in a lifetime experience both on and off the pitch. The 2019 version of the tour will see the players test themselves against top professional academy teams of J League clubs and local clubs before competing in the Reysol Cup to complete an exciting itinerary. The tour is the perfect opportunity for the players to not only experience a competitive international tour environment but also live as young professionals for the tour period as full time footballers. Regular tour updates will be posted here and you can also follow the tour on social media channels Facebook and Instagram. The action on tour kicks off on Friday 11th January, 10 pm NZT with a fixture against JEF United of the J League! Last night provided a tough start to the Japan tour for our U13 group squaring off against a very slick JEF United side from the J League. A brisk 2 degree's on the grass greeted the boys for kick off who had the privilege of playing inside the JEF United stadium. A ground where Miya played J League football for JEF some 20 years ago. In a 4 x 20 minutes fixture the WPSS boys found themselves 2-0 down at the first quarter break against a highly intelligent opponent. The injection of fresh legs and some defensive instruction saw the U13's claw their way back into the game. It was a solid second quarter effort until a late goal meant that the half way stage scoreline had the J League side up by 3 nil. The 3rd quarter was the best showing and several chances were created by a WPSS side that was beginning to get up to speed at this high level. It is important at this level however to take those chances, something that the Japanese hosts were very good at and 1 more goal was added for 4 nil at the end of 3 quarters. The final quarter featured the first WPSS goal of the tour. Gordon Yuan made a penetrating run into the box but was tackled by the last defender, Benji McCarthy picked up the loose ball and calmly slotted the ball in the corner. The last 10 minutes ran away as energy levels dropped and 3 late goals were conceded with the final score 7-1 to the very impressive J League academy side. Ultimately, these experiences are why we invest so much time and effort into international tours. Last nights experience is one that is very difficult to replicate on home soil. There is no doubt it will go a long way to shaping the players future mentality towards football and training. There was no rest for the players over the weekend as Friday nights tough start to the tour was followed up by games on Saturday and Sunday. Saturdays opponent was a local club team from Ichihara which resulted in a confidence boosting victory for the WPSS side. The action took a step up again on Sunday as the Ichihara FA rep team provided the opposition. WPSS started the game well and went up 1nil up through a well worked attack with Nikola Stoychev delivering a cross for Stanley Yugov to finish in the box. The first quarter was very even, both teams created a few half chances but the kiwi boys edged it with a good intensity about them. Ichihara brought on some fresh legs in the second quarter and began to pile on some pressure but were unable to break through and half time arrived with a 1 goal advantage to the WPSS boys. The WPSS U13 started the 3rd quarter very strong. Nathan Walker provided the early impact with an individual effort to beat the centre back for pace before cooly slotting one past the keeper, 2-0. Minutes later the best goal of the tour so far took the score out to 3 nil. Great build up and combination play from the back to break down the right hand side, Seamus Gallagher with a great delivery into the box and a first time volley from Benji McCarthy, 3-0. A 4th quarter goal from the penalty spot for Ichihara from kept the game alive at 3 - 1 and the players had to regroup to make sure a strong finish saw the game out. This was impressively executed and In the final minute of the game, a swift counter attack saw Nathan Walker break the back line and square the ball to Kodie Nicol who tapped it home for a final score of 4 - 1. Overall the performances have significantly got better and better and the group has grown a lot already. It was game on again last night for our U13 group with another massive J League test. Yokohama Marino's is one of the wealthiest clubs in Japan. A very successful youth academy and a long history of producing some of the best Japanese talent. Last night the WPSS boys showed a huge amount of heart and character and made us all very proud. The players still battled to get control of the ball and battled to deal with the pace and intelligent movement at times but they showed that they can compete and the improvement from the first game against a J League opponent in JEF United is immense. Marinos went 1-0 up after 11 minutes scoring from a direct free kick. Tough on the players as they had started the game very positively and were well organised. The second goal arrived from a very swift attack by our hosts, 2 nil and another great test of character. Challenge accepted! Kodie Nicol pulled one back right on the half time whistle after a well executed quick counter attack to bring the game to life once again. A pleasing first half performance where enough chances were created to give the boys great confidence going into the second half. The second half started with another ruthless attack from the J League side and a great goal, 3-1 to Marinos. Just 2 minutes later WPSS showed great heart and passion and clawed the game back when Arri White showed great composure to slot one in the corner of the net to pull it back 3-2. After a few tense and cagey minutes Marino's hit one from distance which found the back of the net to complete the scoring. Post game every player agreed that this game had more intensity than any other game they had previously played in their young careers. These are the games and experiences that will stay with the players for years to come. WPSS started the game lively and did very well to get a foot hold in the game. The boys enjoyed a few successful phases building up and had great success in hurting Reysol on the short counter attack. The WPSS energy and intensity was rewarded in the 18th minute when Nathan Walker whipped in a cross that went in off the back post. With only 1 minute left in the period the players couldn't hold on to the lead as Reysol equalised with the last kick of the half. A disappointing end to what was otherwise a strong 20 minutes. Some fresh legs were injected after 20 minutes to hopefully maintain our intensity but our hosts were just about to put the foot down. Reysol turned up the tempo and the master class began. An exhibition of ball speed, smart positioning, decision making, aggression and a ruthless clinical execution in front of goal were highlights of their 2ndperiod performance. Our J league hosts scored 3 times in quick succession as the WPSS boys struggled to keep up with the pace and get a hold of the football. To the players immense credit they kept going and that effort as rewarded with Gordon Yuan tapping home just before the second period ended to make the score line 4-2 with 20 minutes to play. The team has suffered a few niggles and injuries over the last week and that told in the last period. Reysol applied constant pressure and went on to score 3 goals in the last 20 minutes and a final score of 7 - 2. 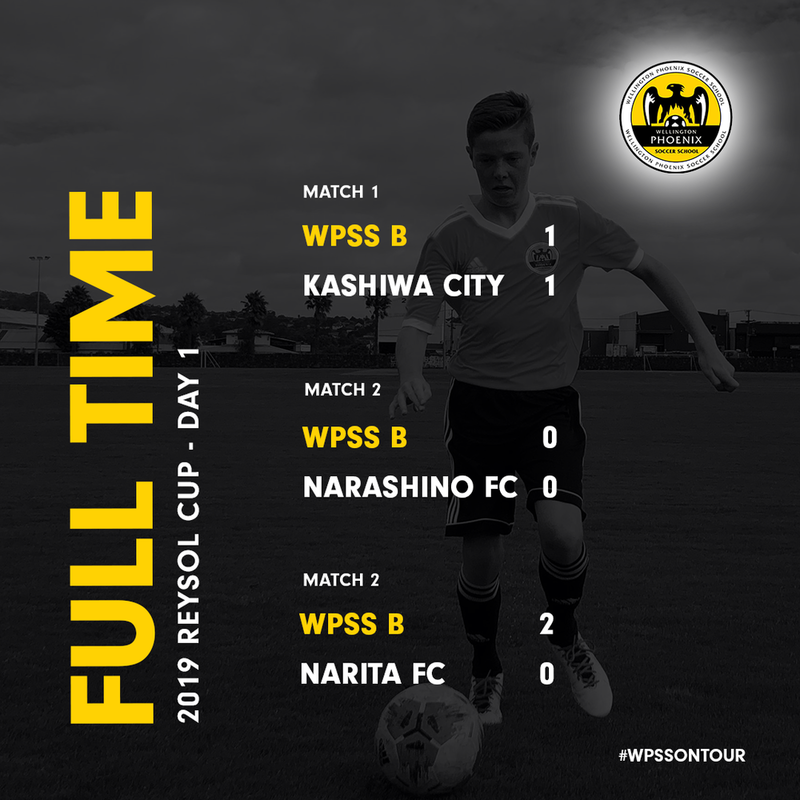 The WPSS U13 group have competed in the 2019 edition of the Reysol Cup over the weekend. WPSS entered 2 teams in the 8 v 8 tournament hosted by J League club Kashiwa Reysol. The WPSS A team went 3 from 3 on day one and took top spot in their group qualifying for the quarter finals. A tough quarter final match up was locked nil all at half time but goals from Kodie Nicol and a Harry Lloyd thunder bolt secured a 2 nil win and progression to the semi final. 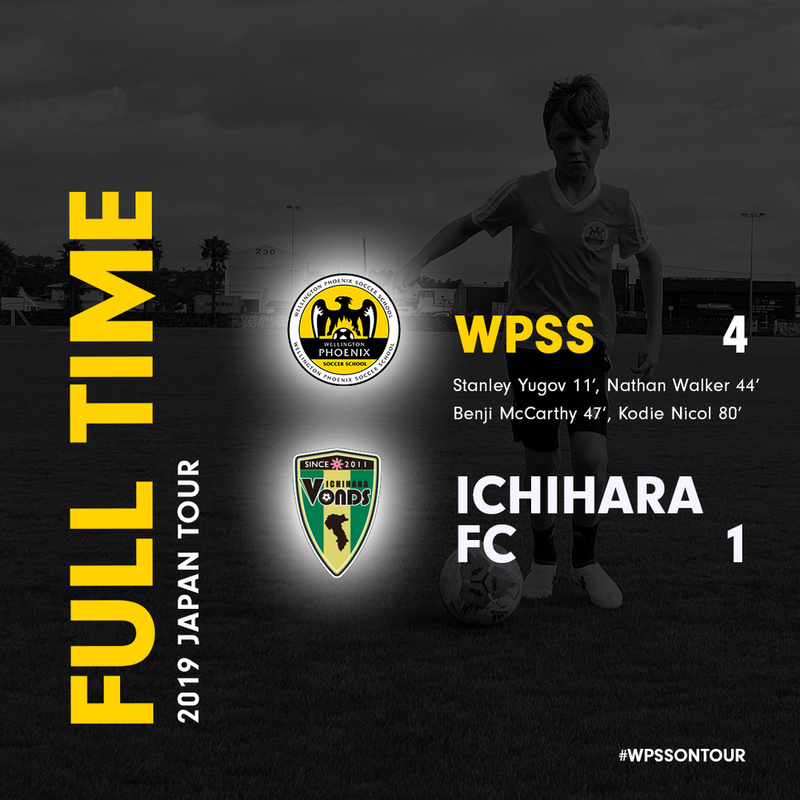 WPSS went up 1 nil against semi final opponent Funabashi FC with a Nathan Walker goal but were quickly pegged back and the game went to penalties after ending 1-1. A tense shoot out went down to the wire and WPSS prevailed 3-2 to progress to the final with Nikola Stoychev hitting the decisive spot kick. The tournament final saw the WPSS boys face J League hosts Kashiwa Reysol. A great performance by the players but not the result the effort deserved as Reysol took their chances and ran out 2 nil winners. WPSS A took out second place at the tournament. WPSS B went unbeaten on day 1 in a tight group but with 2 draws failed to qualify for the quarter finals narrowly missing out on goal difference. Day 2 was action packed with WPSS B playing 3 more games to secure a 9th place finish. Abiko were first up with Arri White (2) and Benji McCarthy scoring the goals in a 3 – 1 win. Ishveer Singh and Benji McCarthy scored the goals that then beat Inzai FC 2 nil and the B team rounded off the event with a 1 nil win in the the 9thand 10thplace playoff, Benji McCarthy once again on target. WPSS B finished the Reysol Cup with an unbeaten overall record from their 6 games. A record of 4 wins and 2 draws would normally see the team challenging for the top prize, a great result to finish as the best team outside of the tournaments quarter finalists. To top off a great day, WPSS had 2 individual accolades when Luke Stroh and Harry Lloyd were named in the tournament team!